Sorry about the lack of posts. I've been working on the draft of my Master's thesis, which is due in a couple weeks. I've been making time to cook, but not to write about it! So I leave you with this photo of a mountainous apple pie that I made a while back (the Anthopologist said, "It's huge! 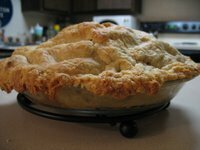 You have to take a photo"), and I promise I'll tell you all about the end of my pie-making challenge, which I officially wrapped up earlier this month. Make sure you celebrate Pi(e) day, March 14th!